Keeper Elliot Justham is hoping to get one over the manager who brought him to Luton Town when the Hatters entertain John Still’s Dagenham & Redbridge this evening. The 25-year-old was snapped up by Still when in charge at Kenilworth Road from East Thurrock United during the summer of 2013 and was made understudy to Mark Tyler. After leaving Luton in December of last year, the experienced manager was swiftly back in a job, appointed Daggers chief, as Justham said: “I owe a lot to John, he brought me into the programme and I wouldn’t be standing here if it wasn’t for him. “So I’ll shake his hand, but obviously we’ve got a game to win so hopefully we can get the result. “It’s good we’ve got a game Tuesday so we haven’t got a week to sit on it (Accrington defeat). “Hopefully we can come out Tuesday, come out of the blocks and get a positive performance and a positive result. Midfielder Pelly Ruddock Mpanzu is also another player who was brought into Luton by Still, when signing from West Ham in January 2014, as he said: “It will be weird, but football’s a business and we’ve got to get three points against another team. “It’s a tough game, they’re going to be fighting for their lives, three points for them matters. 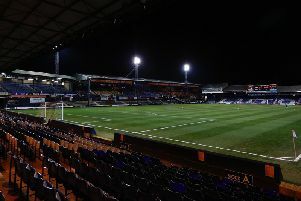 Hatters’ home record this season has been nothing short of terrible, as three consecutive defeats without scoring has put them into double figures for losses in front of their own fans. On just why they have been so poor, Justham added: “The lads thrive on playing in front of crowds, that’s why you play football, so no-one puts it down to anything, it’s just simply got to be better.